In 2013, the SoundStage! 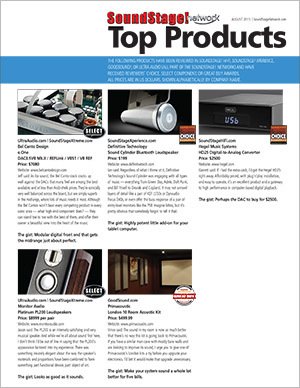 Network began compiling lists of the highest-rated products in a given month (those that received Reviewers' Choice, Select Component, or Great Buy awards), and made those listings available as PDF downloads suitable for viewing online or printing to an 8.5” x 11” sheet of paper. (Hyperlinks to the reviews are embedded, so if it’s viewed online a simple mouse click will take you the corresponding review.) Now that 2013 has passed and our 2013 SoundStage! Equipment Buying Guide is fully up-to-date, the “Top Products” by month are complete and are available on the SoundStage! Network main portal site (SoundStageNetwork.com) where they can be accessed free of charge and downloaded unlimited times. Enjoy!